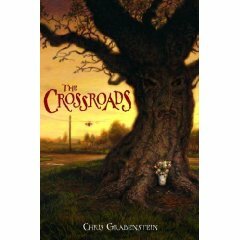 It took me a long time to work up the courage to read Chris Grabenstein’s The Crossroads. I read the first few pages and got scared out of my wits. From the beginning, this book is filled with evil trees and ghost from beyond the grave. But once I got used to having ghosts as some of the main characters, I discovered that there’s really a great mystery to solve here. Zack Jennings really wants to like his new stepmother. She seems nice enough, but Zack keeps wondering when she’s going to yell at him the way his mother used to before she died. When Zack’s family moves to a small town in Connecticut, he begins to realize that life might become really different for him after all. He gets a dog, starts to make a few friends… and a tree keeps trying to kill him. Fortunately for Zack, the pieces of the puzzle start to come together with the help of some local ghosts.